People travel around the world to discover new cultures, meet new people, experience natural beauty and for plenty more reasons. Some say I’m one of those persons too. So much can be found across the boarder that many forget to look around in their own country. For sure you haven’t seen all the cities in your country, visited every national park and tried all the restaurants serving food which is not from your country. I have to admit, again. I’m one of those persons too. 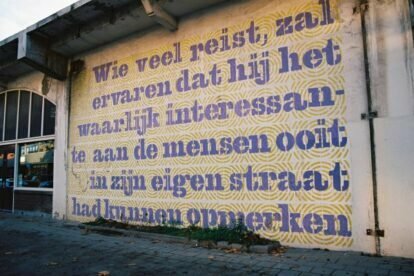 While heading towards the Urban Bakery (see link:Urban Bakery) to get some pie for a birthday party I noticed a quote on the wall (see pic): “Wie veel reist, zal ervaren dat hij het waarlijk interessante aan de mensen ooit in zijn eigen straat had kunnen opmerken”. Translated: “Who travels a lot, will experience the truly interesting about people could have been found in it’s own street”. A quote by Godfried Bomans, a famous Dutch writer from the beginning of the 20th century. Think about it. Did travelling opened up your mind? Still no Japanse restaurants after a trip through Japan? Still no curry at the Indian shop around the corner after spending some time in India? If not, travel more. Like a local.